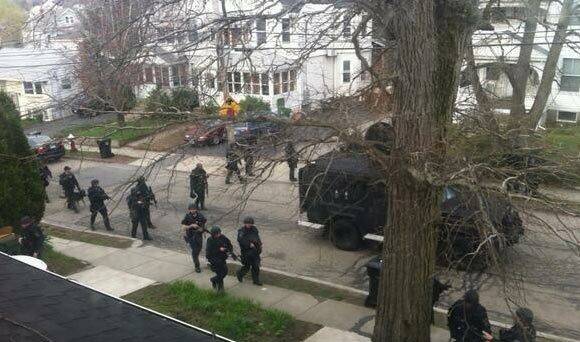 Nazi Germany updated…martial law in Boston after the bombings. 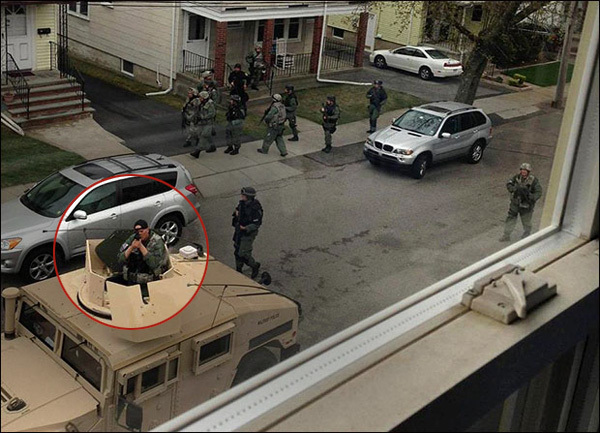 And guess who is in the cross-hairs…We the People, the real terrorist threat against a corrupt government. 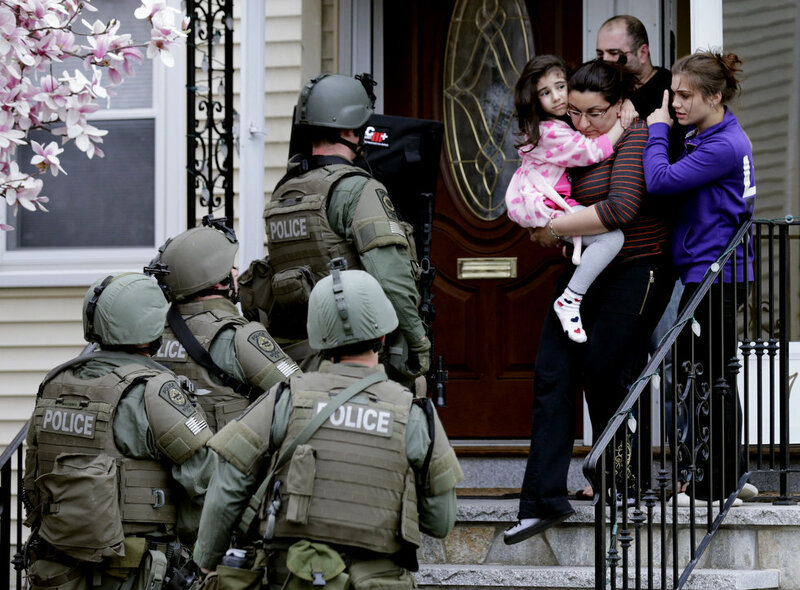 A group of Watertown residents met to vent frustration over what some described as heavy-handed local police and FBI tactics during the search for Boston Marathon bombing suspect Dzhokhar Tsarnaev and community lockdown last April. The meeting at Watertown’s First Parish Church was a stark departure from previous gatherings in this community relative to the marathon bombing manhunt and shootout. Previous mass meetings here have been largely supportive of the police actions on the night of April 19 of last year. But among the 50 or so present at this latest gathering, most were critical of the police and government response. These were some of the voices heard over the course of two hours. 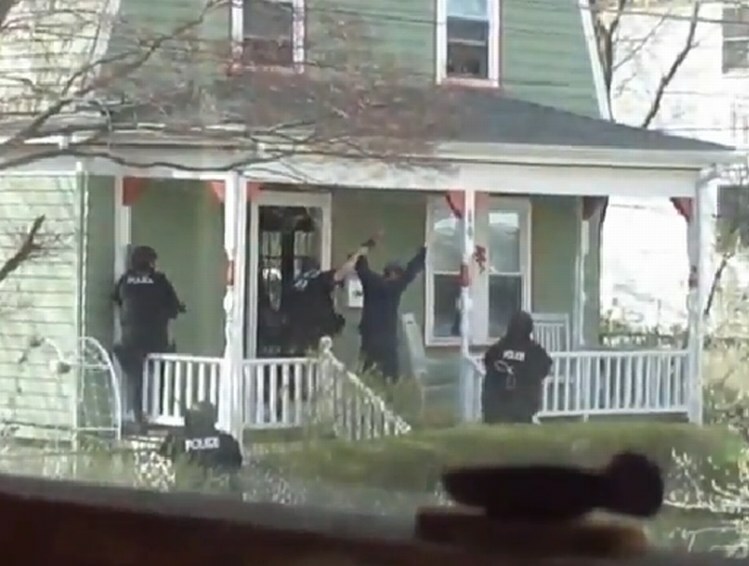 “Had they been competent when they began the lockdown, they would have gone down Franklin Street all the way — Franklin Street is an L-shaped street — apparently one of the SWAT teams only went down one half of the L,” said one resident. “One thing that’s really amplified to me here tonight, is that the FBI can come into any community in the United States — a four-square-mile community like Watertown — and take complete command and control over the local police,” said another. The community meeting was sponsored by the National Lawyers Guild, a progressive legal organization, which has held three previous meetings focused on questions about alleged constitutional violations during the Marathon bombing siege, and within the larger context of the Patriot Act in the post-9/11 era. Some of these concerns have been voiced aloud to local police officials. 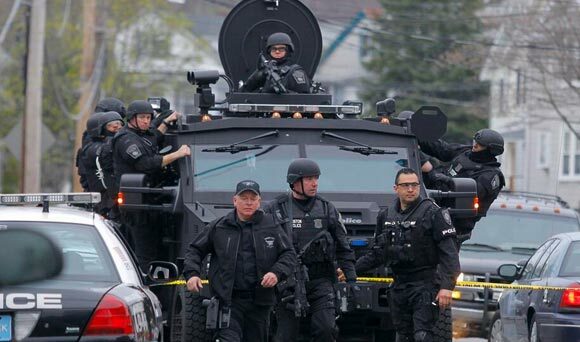 Watertown police chief Ed Deveau said last fall that his force was studying the actions of law enforcement during that period and trying to learn from them. That was six months ago, and a comprehensive report about what went right and what went wrong has yet to be released. Meanwhile, four Watertown residents in attendance at the Lawyers Guild community meeting alleged that they have been under pressure from local police and other residents to keep their criticisms to themselves. WGBH News will follow up this story in the coming days and we are requesting a response from the Watertown police to these and other complaints made by residents at that meeting. This entry was posted in Afghanistan, Corruption, False Flag, Mind Control, Police State, Problem Reaction Solution, Project Artichoke, Surveillance, Terrorism, The Vault. Bookmark the permalink. Thanks for posting this! The anniversary is coming up, so maybe then, we’ll get that report!